My band, Psallite, playing period music. Recently there has been a lot of discussion about Bardic music’s place in the SCA landscape due to an article that came out in the Æthelmearc Gazette last week. In the article and the discussion around it I saw a lot of the same misconceptions of the SCA Early Music community (here on out called “musicians”) that I thought we were past. Apparently not. The purpose of this article is to address the things I’ve heard over the years about musicians and what the musicians want to see in the Bardic community. I want something to link to when I see the same misconceptions repeated every few years. First, a disclaimer. I am not all musicians. I can’t speak for everyone. That said, I do know a lot of musicians in the Middle Kingdom and radiating outward. I host the only period music focused event in the Middle Kingdom. I know the pulse of the music community. I don’t believe a lot of what I say here will be controversial among that community. Musicians want only real pre-1600 music at SCA events. Newly composed music is by definition not period therefore they want to stamp it out. No. I am happy with new compositions, as long as there is an attempt to do it in a period way. Process and intent are more important that product. If someone listens to a period song on YouTube and tries to write something that sounds like that song, that is a success. If someone takes a period tune and writes new lyrics that’s great! If someone writes a poem in rondeau form that’s perfect. The important thing is engaging with period sources. If what makes a bard is telling the stories and history of the cultures we study and our own history, then I am saying that is not enough. Bards also have to engage with period material. At least if they want A&S cred. 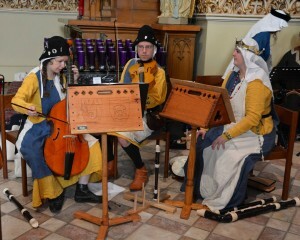 Musicians insist on people using only period instruments. I can’t afford period instruments so I will be rejected. Repertoire is what matters, not what instrument you play it on. If you’re playing period or period-style music on your modern violin or trumpet or mandolin or guitar or plastic Yamaha recorder THAT IS PERFECTLY FINE. In fact, I’d say that’s not even a real barrier to mastery in music. You can tune a guitar like a lute and play all of the lute repertoire on it. You can play all the recorder music on plastic recorders. You can definitely play the repertoire on a modern violin. If you notice that the well respected musicians tend to have fancy period instruments that’s because 1) they’ve been doing this a while and you tend to have more disposable income as you get older and 2) they’ve been at this long enough that they’ve decided that this is an OK place to put their money. They’re going to get enough value out of the instrument for it to be worth it. One of my biggest pet peeves is people who think they can buy their way into the respected musician club. Good technique matters a lot more than a fancy period instrument. Recorder-wise, I play my plastic Yamaha 300 series recorders the most because they play in tune, they don’t care about humidity, and I don’t have to worry about whether I just ate cake before playing them. I unapologetically bring my Casio Keyboard to events because I can play period harpsichord on the keyboard just as well as on the real thing. Also, I don’t have to spend all of the event tuning the keyboard. Like CPDL, IMSLP has robust search capability. Kasha has made singable translations of period music. This is a great place to get started if you want to choose from a wide variety of period stuff. If you want to find the piece in the original language, just google the name of the piece. He was (essentially) an ethnomusicologist in the early 1600s. He went around collecting music “of the people”. This is just the very tip of the iceberg of available period music. This is sadly still true. We can make educated guesses about what music sounded like, but there isn’t the wealth of information for those regions as there is for say, France. I am sad too. My persona is Polish. I did Polish dancing growing up. I’d love to do period Polish court dances in the SCA. But there are no dance manuals. I take what I can get, and keep an ear out for new discoveries. I am also more willing to compromise for those regions. But I don’t think the answer is that we should throw up our hands and just play modern Irish traditional music because the period Irish stuff either wasn’t written down or was lost. Let’s talk about it, see how close to period we can get, and make educated guesses about what the music might have sounded like. I don’t read music, how am I supposed to learn these songs?! I’m thrilled to tell you that today it has never been easier to listen to period music. Just search for the name of the piece on YouTube. Musicians care more about being period than being entertaining. If the only thing my audience will appreciate is a modern style tune, it’s my duty as a performer to give them what they want. That is what good performers do. You have to meet the audience where they are. How entertaining or accessible a piece is and how period it is are not related. It is perfectly possible to have period songs that are really accessible and entertaining. It is also possible to have modern stuff that isn’t. There is a rich middle ground that is acceptable. My repertoire for SCA is 100% period appropriate. Accessibility of said material varies. Kasha’s translation work and the way we perform it is super accessible. Lots of people enjoy Wolgemut; all of their stuff is period. Owain Phyfe was basically a dude with a guitar that played period material in the original language and his stuff was super accessible and well liked. At the other end is the 13th century Perotin piece I learned 5 years ago. An acquired taste to say the least. Good performers do know their audience. But that doesn’t mean a performer has to pull out something modern. If the only thing that the audience will like in your repertoire is something modern, that’s more likely to be a problem with your repertoire and your performing ability, not the source material. Step up your game. And again, newly composed music and poetry can be period appropriate! The only requirement to avoid side-eye from musicians is that the composer consulted period material before writing it. In fact, you won’t just avoid side-eye, you will get praise. Period music is unpalatable to the modern ear. This is just not true. As I said above, Wolgemut and Owain Phyfe both performed period music. Both are well liked by all walks of SCAdians. How accessible and enjoyable a piece of music is has a lot more to do with how it is performed than the music itself. Period music is based on the diatonic scale, which is still used today, therefore the melody I made up is probably period sounding. You know what else is based on the diatonic scale? Just about everything. Bach, Mozart, Beethoven, Chopin, the Beatles, any pop song. That’s a lot of music. There’s a lot of variation. Even within pop music, which is arguably pretty homogenous, people with no musical training can tell the difference between a country song and a folk song and a rock song. Are you going to tell me they can’t hear the difference between Sting’s Dowland album and his usual stuff? Really? One example I’ve heard recently is comparing “Martin Said To His Man”, a period tune, and “Step it Out Mary” a modern day traditional-style tune. I agree that the tune for “Step it out Mary” isn’t glaringly out of period sounding, but to me that just means that writing period sounding tunes today is possible. I might go as far as to say a person who grew up mostly listening to traditional tunes might naturally come up with music that meets the mark. But 1) that applies to almost none of us, and 2) we are a historical group! We should be emulating “Martin Said To His Man” when writing our own songs, not “Step it Out Mary”. Knowing why you think your music sounds period is important! Engaging with the source material is important! Also, the stuff I hear coming out of Bardic is not on the level of Step it Out Mary. The songs I’ve heard have problems like melodic jumps that were not done, and harmonic shifts that were not done. Among other things. To try to help the problem, my band is working on some simple ideas for getting started with writing music that better meets period practice. But to really start writing period-sounding music there is no substitute for playing and listening to it a lot. Writing period sounding music is too high of a bar for newcomers! We want to get people writing as fast as possible! First, much slack must be given to newcomers. Always. If a newcomer performs something that is not to the current tastes of the Society, we let it slide and try to expose them to “better” stuff. We should always assume people have honest motivations. So, newcomers aside, how can we make it easier for newer bards to write in a more period style? Some music is listed on Master Gregory’s page. If you’re not sure how a song sounds, search for it on YouTube. There are almost certainly recordings. It has never been easier to listen to period music. If you want to write your own song? Start with a period poetic form. Here are a few: Rondeau, Virelai, Ballade. Write your poem, then write your tune. You have already met the minimum criteria! Want to go further? Listen to a few songs that use your poetic form. Then attempt to mimic those songs in some way. This is going above and beyond and is AWESOME. Want to take your game up even further? I can point you to some composition treatises and some modern textbooks on period composition. We ask everyone to make an attempt at period clothing for events. That is the same thing I am asking for here. I want composers to attempt to look at period material before writing their song or poem. In period, people were composing music. I am composing music. Isn’t the fact that I am composing music enough? A couple analogies. People wore pants in period. Therefore my blue jeans are enough. People danced in the Middle Ages. Therefore swing dancing at an event is period enough. Composing in and of itself is not enough. We need to engage with period source material, just like every other A&S craft. At least if you want A&S recognition. If Bardic moves in this direction where do our old songs, written before we knew better, go? We will lose our history! Here is where my opinion probably differs from others in the music community. In my opinion, the old songs written to very obviously modern tunes and in very obviously modern forms belong at post revels,private camps, and social media. I believe they don’t belong front and center at court or at feast or in general at events. What should be front and center are our best attempts to capture our history in the forms of our period and with performances most likely to draw people into our period. As for losing our history, we will only lose it if bards don’t translate it to more period appropriate forms, and if they don’t play these forms in an attention grabbing way. This is a call to step up your game! Again, I think my opinion here might not be the most popular. There is only so much time at events. There’s especially little undivided attention the general SCA populace is willing to give performers. What should they be presented with in that little time? My answer is the best period appropriate stuff we have to offer. The dance community faced a similar problem. There is only so much time at evening balls. What dances should be in the ball list? Dances from the period repertoire? Old out-of-period favorites? New choreographies in varying degrees of period-correctness? Ultimately the choice in these parts of the Known World was to fill the ball list with a range of dances from the period repertoire and some newer SCA choreographies. All of these choreographies have at least some period connection, even if they are just Playford 1651 inspired. The Out of Period dances are reserved for dance practices, post-revels, after midnight at the dance tent at Pennsic, and other similar venues. Are some people sad about it? Absolutely. But I think it’s the right decision. It would be sad if our balls were populated with lots of out of period dances when there’s a lot of period repertoire to choose from. I believe that music in the SCA should evolve along these lines. Honestly, I don’t have a real problem with a bardic circle at an event with loose rules. I do get annoyed when the undivided attention of the masses is expected to be given toward non-period or non-period influenced works when there is period-appropriate material that could do the job just as well or better. Do all or most musicians agree with me on this? Probably not. So it goes. Should there be an A&S category for “SCA Genre” music? To me, that’s the same as asking, should there be an A&S category for non-period artistic works. The answer is no. I know someone who makes cake subtleties. I love her work. But it doesn’t belong in an A&S competition. I know someone who paints inspiring images of SCA events. It’s not period, though, and thus doesn’t belong in an A&S competition. The same goes for “SCA genre” music. Now, there’s nothing stopping the Bardic community from having their own competitions. In fact they should! The judges will be far more knowledgeable than the random judges at A&S fairs. I have been very disappointed in the Middle Kingdom judging criteria for performing arts for a long time. To combat it, I instituted master classes at St. Cecilia, where musicians could get useful feedback from the SCA’s musical experts on their performance instead of getting docked points for their garb. (Or the garb of their accompanist. *facepalm*). There’s no reason the Bardic Community couldn’t do the same thing. We don’t know anything about what the common folk sung in period. We don’t have extant secular music. And if you just want secular music… Entire genres full of music. Troubadours, chansons, madrigals, lute songs. Each of these has hundreds of secular pieces to choose from. Many have modern editions freely available if you have an Internet connection. You can find them if you look. If you want help finding a particular kind of piece, let me know and I will help you! The Early Music space in the SCA is rich in both material and in enthusiasm. Last year at St. Cecilia we had a giant group of musicians sing of Allegri’s Miserere. A few years ago a group got together and put together a performance of the entire Cantigas d’Amigo set. My band is experimenting with performing period works in translation, and it’s been very well received. I love being able to bring sheet music to an event and playing through it with people. I love that people are developing a taste for Early Music. I would love to see more overlap between the Bardic community and the Early Music community. There’s knowledge in both communities that we could benefit in sharing. I hope this article inspires all musicians and bards to raise the bar. Next post: What Recorder Should I Buy?